246 pages | 10 B/W Illus. Although the literature on party politics has significantly advanced both methodologically and theoretically in recent years, the study of political parties in Turkey has been noticeably disconnected and lacking from such conversations. 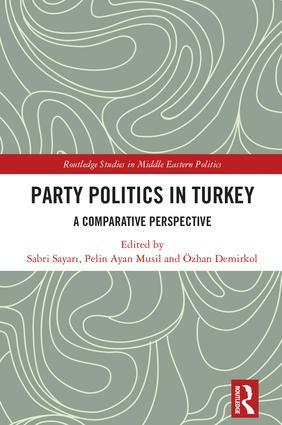 This book evaluates well-established theories and trends in exiting party politics literature and relates them to the case of Turkey. It explores fundamental questions such as: Who controls party organizations and how does the locus of control change over time? What kinds of power struggles are observed inside a party and between whom? What do the present and past records of party membership imply for party organizations? What role do grassroots activists play in local and national politics? How do the ideological orientations of party members differ from party leaders and other voters? What types of social cleavages shape political parties and how do they change over time? What constitutes the relationship between the state and parties today? Who finances political parties and what does this imply about the quality of democracy? How and why do party systems change? The various chapters show that party politics in the Turkish context is significantly different to Western and new democracies. By highlighting the significant contribution the Turkish case can make to existing conceptual frameworks and theories, this book will be a valuable resource for anyone studying political parties, party systems and comparative politics, as well as Turkish politics. Sabri Sayari is Emeritus Professor of Political Science at Sabanci University in Istanbul, Turkey. He has published extensively on parties and party systems, political clientelism and patronage, and political violence. Pelin Ayan Musil is Senior Lecturer of Politics at Anglo-American University and a Research Fellow at Jan Evangelista Purkyne University in the Czech Republic. Her research interests include political parties and democratization. Özhan Demirkol is Assistant Professor at Ömer Halisdemir University in Nigde and visiting researcher at Leiden University, The Netherlands. His research interests include factionalism, new party formation, party system change, and party finance. This series is concerned with recent political developments in the region. It will have a range of different approaches and include both single authored monographs and edited volumes covering issues such as international relations, foreign intervention, security, political Islam, democracy, ideology and public policy.